You know, when you do a search on the web for the best toys for twins, you get plenty of unrelated stuff. We have done our best to sort through the clutter and find some really fun, unique stuff. There are not many toys made specifically for twins, but there are loads of toys that are well suited for twin children to play with. These are some really great ideas whether you're buying for your own twins or for someone else's as a gift. 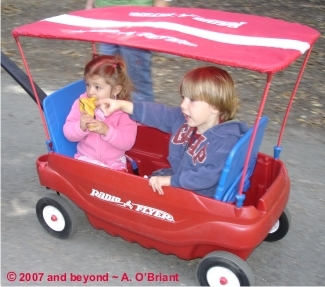 From plush toys to wagons, read on for more information. 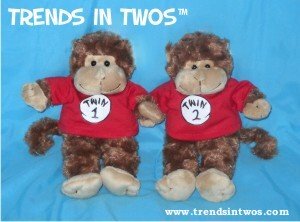 Trends In Twos™ offers a great selection of plush animal pair toys for twins, like the Twin 1 and Twin 2 monkeys (left). They also have "Twincess" Unicorns, Monkey See and Monkey Do pairs, Alligator and Crocodile pairs, and more. Some can even be personalized with each twin's name. Each gets their own to play with and there won't be any mix up on who's is who's because of the unique t-shirts each animal wears. We like that these toys are the same, yet different, just like twins! Visit www.TrendsInTwos.com for the full selection. 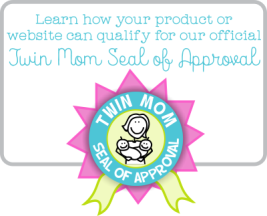 The Twin Swim Float is perfect for those hot summer days with twins! Twin Swim/Pool Float - Shop Now! 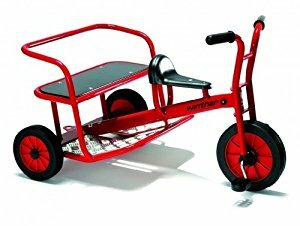 This sturdy trike allows several children to play together at the same time. One child can pedal while 2 more children sit in the rear. Ideal for twins and another sibling or friend. The Twin Taxi stimulates the imagination and promotes role-play. With a trailer behind, the possibilities for advanced games are even greater. Made for ages 4-8 and manufactured in Denmark. This twin toy is expensive, but oh so cool! 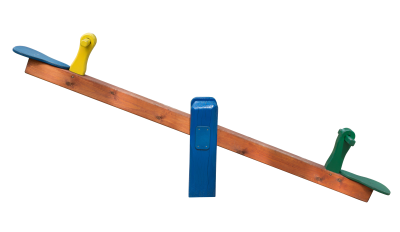 We really like this easel manufactured by Step 2. 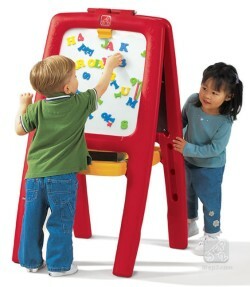 This two-sided easel is twice the fun and a great toy for twins of any combination! There is a chalkboard on one side and write-and-wipe board on the other. The sturdy plastic frame sets up quickly and folds flat for easy storage. It also includes a 74-piece set of magnetic letters and numbers and a clip on each side to hold paper in place for drawing or painting. The durable plastic center tray can hold large supplies or completed artwork, while deep trays on both sides keep supplies within easy reach of little artists. Minimal adult assembly. 42 1/2"H x 26 1/2"W x 22 3/4"D. For ages 2 years and up. Okay, seriously, best toy for any kid, let alone twins! Who doesn't remember having one of these? I know we have listed a lot of "classics", but this one probably takes the cake! Not to mention, Radio Flyer makes a few different models of their original - like the Voyager shown here. We particularly enjoy this one for obvious reasons...it's a two seater! These can be used for parents to tote twins around when they're small and then older twins can use them for imaginative play in a number of ways. A classic since 1966, this is a fun toy for twins to play with. 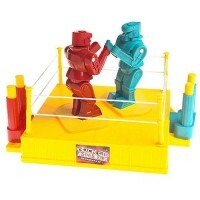 Two contenders control the plastic boxers every move until the winner knocks loose the others spring-loaded head. Lots of action and competition. You can pick one of these up at most big box toy stores and also on the internet. Ideal for ages 6+. How can you resist with a price tag of about $20? Many of us have fond memories of playing at the park on a teeter totter. These days you can buy one just the right size for your twins, your yard, and your budget! What better outdoor toy for twins to play on together? You won't believe the variety available online or at your local home goods store for a range of age groups. 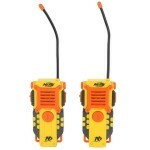 Every set of twins should have a set of walkie talkies (one of the most engaging toys for twins). They can keep in touch in a variety of ways while playing with these. So much fun for spy games and telling secrets! Great for twins with separate bedrooms to communicate at night time too. There are so many makes and models to choose from you are sure to find something just right.